Endotoxin detection in human patients has been a difficult challenge, in part due to the fact that the conserved active portion of the molecule (lipid A) is a relatively small epitope only amenable to binding by a single ligand at any one instance and low levels (pg/ml) are capable of stimulating the immune system. The endotoxin activity assay, a bioassay based on neutrophil activation by complement opsonized immune complexes of lipopolysaccharide (LPS), has allowed the specific detection of the lipid A epitope of LPS in a rapid whole blood assay format. This review summarizes diagnostic studies utilizing the endotoxin activity assay in a variety of hospital patient populations in whom endotoxin is postulated to play a significant role in disease etiology. These include ICU patients at risk of developing 'sepsis syndrome', abdominal and cardiovascular surgery patients and patients with serious traumatic injury. Significant features of these studies include the high negative predictive value of the assay (98.6%) for rule out of Gram-negative infection, ability to risk stratify patients progressing to severe sepsis (odds ratio 3.0) and evidence of LPS release in patients with gut hypoperfusion. Preliminary studies have successfully combined the assay with anti-LPS removal strategies to prospectively identify patients who might benefit from this therapy with early evidence of clinical benefit. The investigation of the role of endotoxin, also known as lipopolysaccharide (LPS), in the pathophysiology of sepsis in patients who are treated in hospitals has been pursued since LPS was first discovered in the 1800s as a Gram-negative cell wall toxin capable of triggering lethal shock. The role of bacterial LPSs in human disease has been reviewed by Opal , Munford  and Danner . Zeigler and colleagues  were among the first to attempt anti-endotoxin therapy in patients with severe sepsis using anti-serum against the J5 mutant of Escherichia coli as a source of anti-core glycolipid antibody. Unfortunately, a subsequent litany of anti-endotoxin therapies attempting to block the toxic effects of lipid A have failed US Food and Drug Administration (FDA) clinical trials and have included monoclonal antibodies (E5 (an anti-endotoxin antibody developed by Xoma Corp.), HA1A (an anti-endotoxin antibody developed by Centocor Corp.)), binding peptides (bactericidal/permeability increasing peptide (BPI)), phospholipid emulsions (artificial high density lipoprotein), lipid A antagonists (Eritoran) and toll like receptor (TLR)4 antagonists (TAK-242). Conceptually, several major problems may exist in the anti-endotoxin strategies employed to date, none of which have used a diagnostic assay to identify patients who might benefit from anti-LPS target-directed therapy. Also, patient selection in clinical conditions in which endotoxin release into the systemic circulation may play a major role in mortality has been difficult due to the heterogeneity of conditions that manifest systemic endotoxemia. An argument that prophylactic anti-LPS therapy may be the only effective modality can also be made since many of the major pro- and anti-inflammatory cytokine and mediator networks are activated early following endotoxin release into the systemic circulation and subsequent endotoxin tolerance may be induced [5, 6]. Recent studies by Ronco and colleagues , however, have suggested that anti-endotoxin adsorption via hemofiltration may have clinical benefit and reduce mortality in a cohort of patients with severe sepsis or septic shock following emergency abdominal surgery (Early Use of Polymyxin-B Hemoperfusion in Abdominal Septic Shock (EUPHAS) trial). The long-term effects of chronic endotoxin exposure are not well known and have been most extensively studied by McIntyre and colleagues  and Levine and colleagues  in patients with chronic renal failure, including those who are on hemodialysis. Their studies have shown that hemodialysis patients have chronically elevated endotoxin levels and have a reprogramming of leukocyte response to endotoxin with chronic elevations in pro-inflammatory cytokines such as tumor necrosis factor alpha. Hemodialysis patients have a yearly mortality of approximately 30% and their chronic endotoxin release may be related to fluid shifts that affect gut permeability during dialysis sessions . Initiation of hemodialysis significantly increased endotoxin levels from a mean level of 0.13 endotoxin units (EU)/ml to 0.34 EU/ml post-procedure . Endotoxin levels were significantly correlated with myocardial stunning, troponin I levels and a drop in systolic and diastolic blood pressure during hemodialysis , suggesting that changes in gut permeability or hypoperfusion may be responsible for LPS translocation. The Limulus amoebocyte lysate assay (LAL), discovered by Bang and Levin , was the first bioassay that allowed the detection of LPS by chemical means, supplanting the rabbit pyrogen test, which detected changes in core body temperature following endotoxin exposure. This assay has been extensively used in studies evaluating endotoxin levels in sepsis, most notably by van Deventer and colleagues  and Bone and colleagues , although its application to whole blood and plasma or serum has been problematic due to suppression and/or activation of the assay, as reviewed by Hurley . The presence of specific LPS-binding proteins such as LBP, soluble CD14, BPI (in inflammatory conditions) and platelets in blood have been postulated to interfere with both chromogenic and clot detection-based LAL assays. These LPS binding elements can result in signal enhancement or suppression, which is observed as samples are serially diluted depending on the sample pretreatment used to remove protein constituents. Although LAL-based assays can detect endotoxin in serum or plasma, extensive sample preparation is required (dilution with pyrogen free water and heating) and assays are generally performed in batch mode with subtraction of baseline signal and are potentially confounded by environmental contamination unless scrupulous precautions are used. These limitations make it difficult to perform LAL-based endotoxin assays in a single dose format suitable for rapid analysis and prospective patient selection. No LAL-based assay has been US FDA approved to date for human diagnostic applications. We have chosen to address the diagnostic challenge of detecting systemic endotoxemia in a rapid fashion by introducing an alternative assay strategy that employs priming of neutrophils by LPS-antibody complexes that are complement opsonized as a signal transduction and amplification mechanism  (Figure 1). This assay can be performed in a unit dose format with result generation in 30 minutes and is suitable for patient triage and selection for anti-endotoxin therapy. This assay was approved by the US FDA and European regulatory agency in 2004 for human diagnostic use as a tool to assess the risk of septic shock on the basis of results achieved in the Measurement of Endotoxin in the Intensive Care Unit (MEDIC) trial, which enrolled more than 800 ICU patients with systemic inflammatory response syndrome and suspicion of infection . The MEDIC trial correlated elevated admission endotoxin levels with the risk of developing sepsis within 24 hours of ICU admission (odds ratio 3.0, P < 0.001), severity of illness (P < 0.0001), risk of hospital and ICU mortality (P = 0.04) and risk of Gram-negative infection (P = 0.0004) . Reaction mechanism for endotoxin activity assay utilizing anti-lipopolysaccharide monoclonal antibody and autologous whole blood. Complement opsonised IgM-lipopolysaccharide (LPS) complexes interact with CR1 and CR3 complement receptors on neutrophils, resulting in a priming of the NADPH oxidase complex. The neutrophil respiratory burst is evoked using zymosan and measured by chemiluminescent emission from luminol. The magnitude of respiratory burst is proportional to the logarithmic concentration of LPS in the sample. The endotoxin activity assay (EAA) quantifies endotoxin levels via a relative scale from 0 to 1.0 based on an internal endotoxin standard that is added to each patient sample . The assay is composed of three separate reactions all containing the patients whole blood: a blank that contains all reagents excluding anti-lipid A antibody; a sample tube that contains anti-lipid A antibody; and a maximal response tube that contains a saturating dose of exogenous endotoxin. The endotoxin acitivity is measured by stimulation of the neutrophil respiratory burst with zymosan and emission of light via reaction of oxidants (primarily HOCl) with luminol. The endotoxin activity (EA) is calculated by a simple algorithm based on light emission measured in a luminometer sensitive to light in the 450 nm range (Patient sample with antibody - Patient sample without antibody)/(Patient sample with maximal endotoxin - Patient sample without antibody). A hyperbolic dose-response relationship between endotoxin levels and EA as measured by neutrophil-dependent chemiluminescence was presented in the original methods publication . This dose-response relationship has recently been updated using a WHO referenced endotoxin standard with the current assay format (Figure 2). The dose-response relationship for WHO standardized LPS and E. coli 055:B5 LPS is depicted in Figure 3. The difference in the slope of the linearized plots is due to a higher per unit mass content of lipid A in the WHO standardized LPS (200 pg/EU) compared to the E. coli 055:B5 LPS (1,200 pg/EU). The most sensitive part of the dose-response curve (largest change in EAA per LPS dose) was empirically designed to cover endotoxin concentrations that were found in patients with confirmed Gram-negative infection but absence of septic shock (0.1 to 0.3 EU/ml; unpublished results). The precision of the assay using an automated chemiluminometer (LB 953, Berthold) yielded a CV (co-efficient of variation, standard deviation divided by mean times 100) of less than 10% at EAs above 0.4 (US FDA submission, MEDIC trial). Subsequent studies using a manual luminometer (Berthold Smartline) by Wahl and colleagues  have documented CVs between 11.9% and 18.6% for EA values between 0.38 and 0.7 (suggested normal low <0.4 EA units, intermediate level ≥0.40 and <0.6, high level ≥0.6 EA units). This group also independently validated the normal reference range using a healthy population of 43 men and 57 women aged 32 ± 14 years as <0.42 EA units (95% cutoff value). After extensive review of EAA results in a total of 469 patients, the US FDA determined that steroids for septic shock, despite inhibiting neutrophil function, had no influence on EAA results (FDA review EAA assay). Unlike LAL-based assays, the EAA is insensitive to extrinsic environmental endotoxin contamination, as demonstrated in Figure 4. In the absence of blood proteins the assay is approximately 500 to 1,000 times less sensitive to endotoxin due to the necessity for blood proteins to disaggregate and expose the cryptic lipid A domain in whole blood for efficient binding to the anti-lipid A antibody. 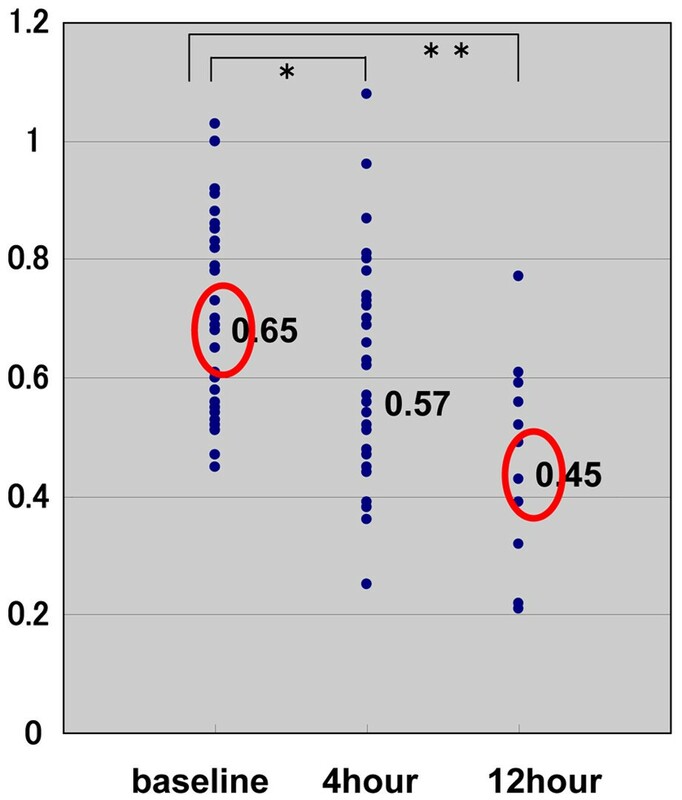 Even at endotoxin concentrations of 1,000 pg (1.3 EU, E. coli 055:B5 LPS) in the assay buffer the EA is not elevated above the suggested normal cutoff of 0.4 EA units (Figure 4). Assay specificity for Gram-negative bacteria possessing a lipid A epitope was established with a lack of reactivity against Gram-positive and fungal antigens . 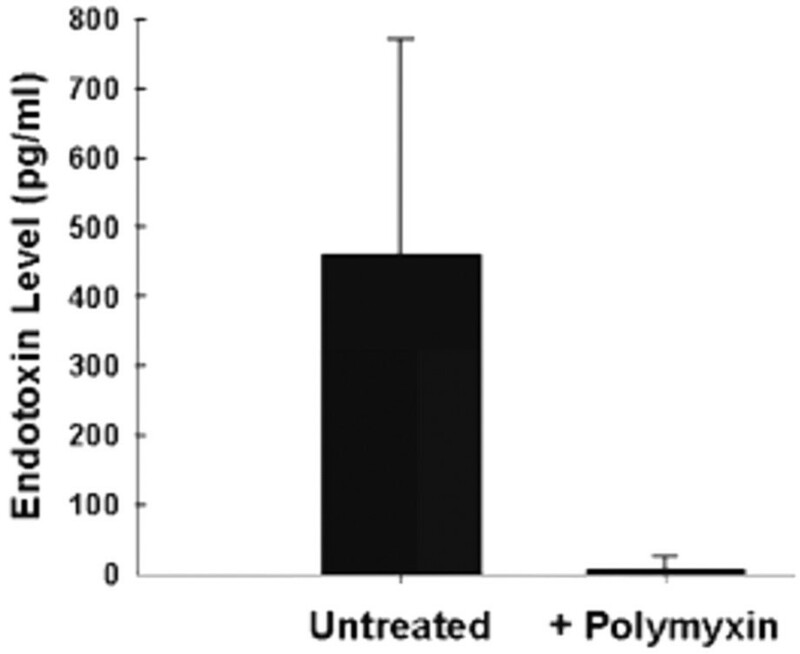 Assay specificity was also confirmed by inhibition studies with the lipid A binding peptide polymyxin B in ICU patient samples  (Figure 5). Typical patient dose response to endotoxin. 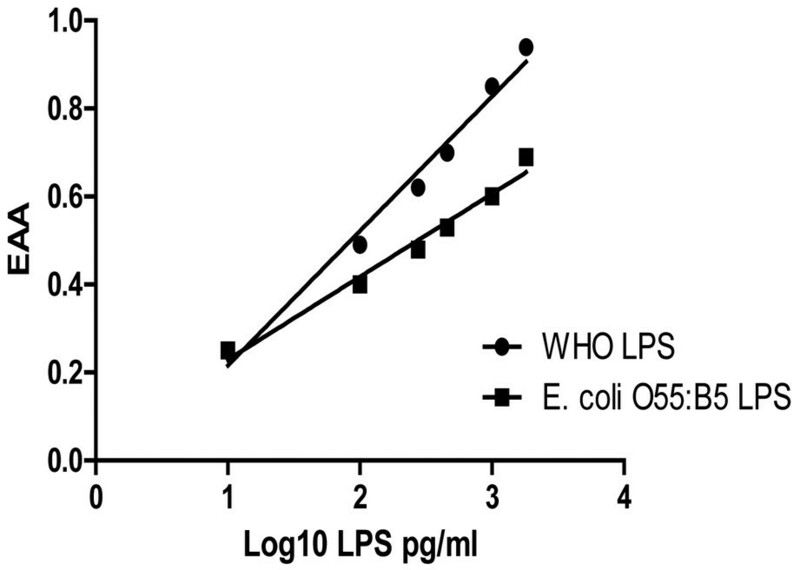 Two response curves are illustrated utilizing the second International (WHO) lipopolysaccharide (LPS) standard preparation (E. coli 0113:H10:K, 10 EU/ng) and LPS from E. coli 055:B5 (3.58 EU/ng) currently used in the endotoxin activity (EA) assay. Linearized dose response with endotoxin acitivity plotted against the log(10) lipopolysaccharide concentration. The difference in reactivity between the two lipopolysaccharide (LPS) preparations relates to differences in purity, polysaccharide chain length and lipid A structure. EAA, endotoxin activity assay. Assay contamination study. 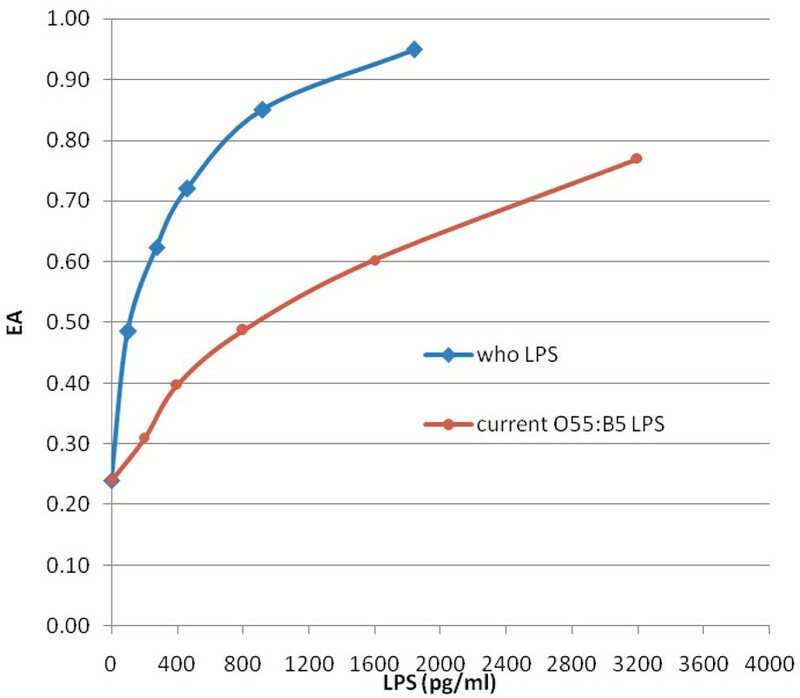 Endotoxin activity (EA) assay buffer (1 ml) was spiked with either 230 pg (n = 3) or 1,000 pg (n = 3) of E. coli 055:B5 lipopolysaccharide (LPS) (3.58 EU/ng). Different control patients were used for each dose of LPS. Average EAA values are depicted in blue, error of measurement (1 standard deviation from mean) depicted in red At 1,000 pg per assay the endotoxin activity was statistically higher than the control (*P < 0.05, paired Student t-test) but still below the normal cutoff of 0.4. Inhibition study with polymyxin B. Fifteen consecutive ICU patients with elevated endotoxin levels had endotoxin acitivity assays repeated following addition of polymyxin B to their blood (300 μg/ml for 20 minutes at 37°C). The dose response for the second International WHO standard E. coli 0113:H10:K lipopolysaccharide (LPS) was used to estimate the endotoxin concentration in the patient blood samples. The MEDIC trial was the first large diagnostic trial to evaluate the EAA in a cohort study of 857 patients admitted to an ICU . On the day of ICU admission, 57.2% of patients had either intermediate (≥0.40 and <0.6 EA units) or high (≥0.60 units) EA levels. Gram-negative infection was present in 1.4% of patients with low EA levels, 4.9% with intermediate levels (odds ratio 3.7), and 6.9% with high levels (odds ratio 5.3). Endotoxemia was also common in patients with Gram-positive infection; 3.8% of low EA levels had evidence of Gram-positive infection, 7.9% with intermediate levels (odds ratio 2.2) and 5.7% with high EA levels (odds ratio 1.5). The prevalence of Gram-positive infection was only significantly increased for patients with intermediate EA values (P < 0.05) but the mechanism of LPS release in the presence of Gram-positive infection is not known. EA had a sensitivity of 85.3% and a specificity of 44.0% for the diagnosis of Gram-negative infection as adjudicated by an expert panel. Rates of severe sepsis were 4.9%, 9.2% (odds ratio = 2), and 13.2% (P < 0.01, odds ratio = 3), and ICU mortality was 10.9%, 13.2%, and 16.8% for patients with low, intermediate, and high EA levels, respectively (P = 0.04). Stepwise logistic regression analysis showed that elevated Acute Physiology and Chronic Health Evaluation (APACHE) II score, Gram-negative infection, and emergency admission status were independent predictors of EA. Although documentation of endotoxemia lacks specificity for diagnosis of Gram negative infection, a low level of circulating endotoxin supports the conclusion that invasive Gram negative infection is unlikely: only 1.2% of patients with low levels of endotoxemia had infection with Gram-negative organisms, and only 5% of these patients were infected with any organism (negative predictive value = 98.6%). Irrespective of cause, the presence of high endotoxin levels in ICU patients was associated with increasing mortality and organ dysfunction. In a retrospective analysis of repeated endotoxin measurements from the MEDIC trial, Klein and colleagues  evaluated the dynamics of endotoxin changes in ICU patients over time. The analysis of 1,301 endotoxin assay results in 345 patients demonstrated a significant relationship between fluctuating endotoxin levels and degree of organ dysfunction (P < 0.05). This study demonstrated that fluctuations in circulating endotoxin levels were associated with worsening organ dysfunction as opposed to other physiological parameters that show diminished variability in patients with sepsis and organ failure. These fluctuations in endotoxin may be due to an inability of the host and concurrent clinical interventions to control and localize foci of infection that drive the systemic inflammatory response. The mechanistic rationale as to why fluctuating endotoxin levels correlate with deteriorating organ function is unknown and an unexpected finding. The EAA-J trial was a seven center observational study conducted in Japanese ICUs designed to: (1) assess the prevalence of endotoxemia as measured by the EAA in Japanese patients admitted to ICU with signs of systemic inflammatory response syndrome; and (2) understand the impact of polymyxin B hemoperfusion (PMX-DHP) on EAA results in patients with severe sepsis and septic shock . A total of 215 patients were studied, of whom 42 received PMX-DHP treatment; 22% of patients had an EAA of <0.40 in the low range, 35% of patients had an intermediate EAA (0.40 to 0.59), and 43% of patients had an EAA in the high range. This distribution is similar to that observed in the MEDIC trial in Europe and North America. In those patients treated with PMX-DHP, the pre-treatment EAA decreased from a mean of 0.65 before treatment (n = 42), to 0.57 within 4 hours of completing one treatment (P < 0.05, n = 42), and 0.45 (P < 0.01, n = 42) 12 hours post-treatment (Figure 6). This drop in EAA levels is approximately equivalent to a 50- to 100-fold drop in LPS concentration since a large change in LPS concentration results in a proportionally much smaller change in EA values in this part of the dose-response relationship (Figure 3). This trial implied that PMX-DHP reduced endotoxin levels as measured by the EAA an average of 26.1% (absolute concentration drop of 50- to 100-fold). Since no parallel placebo control group was included in this study, a definitive comment about the efficacy of treatment could not be made. In this study EA was measured 4 and 12 hours post-treatment and the lowest levels of EA were achieved at the 12 hour time point, suggesting that a considerable time period is required for re-equilibration of endotoxin. Endotoxin activity assay scattergram values for patients (n = 42) undergoing polymyxin B column hemoperfusion. Mean endotoxin activity assay (EAA) values are indicated in bold. Samples were drawn before perfusion (baseline, n = 42) and at 4 (n = 42) and 12 hours post-column treatment (n = 42). At 4 hours the mean EAA was 0.57 (*P < 0.05 versus baseline) and 0.45 at 12 hours (**P < 0.01 versus baseline). All patients showed a decline in EAA values at 12 hours post-column treatment. There was no placebo control group in this study. The red circles highlight the significant drop in mean EAA values from pre-treatment to 12 hours post-treatment with an estimated 50-100 fold reduction in endotoxin concentration. In a preliminary anti-endotoxin therapeutic trial, Novelli and colleagues  used the EAA to select patients diagnosed with post-surgical sepsis for treatment with a PMX-DHP column (Toray, Japan). Twenty-four patients were enrolled in the study and 11 had EA values >0.6 and were therefore treated with a hemoperfusion column to remove endotoxin. Nine of the eleven patients treated with PMX-DHP showed evidence of Gram-negative infection within 72 hours of enrolment. Fourteen patients with low and intermediate values of EA (median value 0.32) showed the presence of Gram-positive infections in 7 of 13 patients, 4 mycetes infections and 2 fungal infections. Patients were treated with a PMX-DHP column every 24 hours if the EA value remained elevated above 0.4 and patients were exhibiting symptoms of systemic inflammatory response syndrome. The hemoperfusion was stopped when post-treatment EA values were below 0.4. The patients treated with the hemofiltration column showed a consistent drop in EA values after each cycle of hemofiltration. Following the last hemofiltration treatment when EA levels were <0.4 the authors observed a statistically significant improvement in hemodynamic parameters. The mean arterial blood pressure increased from 69.5 mmHg to 84 mmHg (P < 0.01) and the heart rate decreased from 111.7 beats/minute to 77.9 beats/minute (P < 0.01). All patients in this study survived 28 day follow-up. One of the goals of this study was to evaluate the practicality of using EAA to choose patients for PMX-DHP and also as an indicator of the need for repeat therapy. This study demonstrated the feasibility of using EAA as a biomarker to identify an at-risk population and demonstrated that the specific therapy had the desired effect of lowering the levels of the toxin following each therapeutic cycle. Due to the absence of a high endotoxin control group not treated with selective adsorption therapy, a definitive conclusion about the efficacy of therapy could not be made. Multiple trauma has been associated with the activation of the innate immune system even in the absence of infectious pathogens. This study was undertaken to evaluate whether possible gut hypoperfusion in these patients was associated with endotoxemia . In this trial 29 patients were recruited with injury severity scores >16 (mean injury severity score 41 ± 15). Endotoxin levels were measured by EAA on admission and days 1, 3 and 5. The mean initial admission EA value was significantly lower than day 3 or day 5 (0.25 versus 0.4 and 0.41, P < 0.001). Both maximal EA levels (0.65 versus 0.46 , P = 0.008) and average EA from admission to day 5 (0.48 versus 0.33, P = 0.006) were higher in non-survivors versus survivors. The presence of shock at admission correlated with the EA level (r2 = 0.21, P < 0.05 ) and predicted higher average EA (0.4 versus 0.3, P = 0.02) and maximal EA levels (0.52 versus 0.43, P < 0.05). The admission base deficit as a measure of hypoperfusion correlated with maximal EA levels (r2 = 0.18, P = 0.04).The average EA level was correlated with the average Multi-Organ Dysfunction Score burden  across day 1 to day 10 (r2 = 0.19, P = 0.04) or across day 5 to day 10 (r2 = 0.18). In this study 17% of the patients died after 10 ± 2 days of admission and no correlation between infection status and endotoxemia was examined due to the small sample size. Endotoxemia, presumably of gut origin, was common over the first few days following severe multiple trauma. The appearance of endotoxin in the circulation was associated with early post-injury hypoperfusion and both its magnitude and persistence were correlated with the development of organ failure. Nadel and colleagues  studied the prevalence of endotoxemia in 100 children admitted to the pediatric ICU and any associations with disease severity and outcome. A single EAA was performed within 24 hours of admission. Endotoxemia was common in this population, with 55% of those studied having EA levels >0.4. The EA level was significantly lower in pediatric ICU postsurgical patients compared to patients with respiratory complications or sepsis (P = 0.01). An infectious cause of admission was significantly associated with endotoxemia (P < 0.005). Endotoxemia on admission was not associated with risk of shock or death, but there was a tendency for increased Pediatric Logistic Organ Dysfunction (PELOD) score and length of stay in endotoxemic children. In children at risk of gut barrier dysfunction, Pathan and colleagues  studied 61 patients who were surgically treated for congenital heart disease. In this study blood levels of endotoxin (EAA), intestinal fatty acid binding protein (IFABP), lipopolysaccharide binding protein (LBP), monocyte TLR2 and 4 and HLA-DR were assayed in conjunction with a microarray analysis of the monocyte transcriptome (pre- and 24 hours post-surgery). Levels of IFABP, an indicator of gut barrier dysfunction and endotoxin were greater in children with heart septal wall lesions. Endotoxemia as measured by EAA was associated with severity of vital organ dysfunction, postoperative Paediatric Index of Mortality-2 score, C-reactive protein, lactate, inotrope requirement and length of ICU stay (P < 0.05, multivariate linear regression, Spearman rank correlation). Monocyte transcriptomic analysis indicated a significant dysregulation of pathogen-sensing pathways with enrichment of key inflammatory and pathogen-sensing pathways, including TLRs, TREM-1 (triggering receptor expressed on myeloid cells) and interleukin-10 signaling. The investigators concluded that children undergoing surgery for repair of congenital heart defects are at increased risk for intestinal mucosal injury and endotoxemia, which may exacerbate postsurgical recovery. They suggested that endotoxin assays may be useful to guide the use of anti-LPS or immunomodifying therapies in these patients. In an adult study of patients undergoing cardiopulmonary bypass, Klein and colleagues  studied the prevalence of endotoxemia in 54 adult patients undergoing aortocoronary bypass grafting using the EAA. Blood samples were drawn at the induction of anesthesia (T1), immediately prior to release of the aortic cross clamp (T2) and on the first post-operative morning (T3). In this study only 13.5% of patients had EAA levels ≥0.6 at T2 immediately prior to cross clamp release. There was a positive correlation between EA and duration of surgery (P = 0.02) and an elevated EA >0.4 at T2 was associated with a significantly increased risk of postoperative infection (26% with elevated EA versus 3.5% with normal EA, P < 0.04). The highest levels of EA (measured over three post-op time points) during the course of 24 hours were also associated with increased risk of post-operative infection (P < 0.03). Yaroustovky and colleagues  utilized an endotoxin hemofiltration strategy on 33 patients undergoing cardiac surgery for valve repair and other non-aortocoronary bypass procedures with an Alteco adsorber (11 patients) and a Toray PMX-F column (22 patients). Both groups of patients showed a drop in EA following hemosorption therapy (Toray 0.7 to 0.55 EA units, Alteco 0.8 to 0.66 EA units). Both groups of patients showed an increase in mean arterial pressure on the second day post-treatment (Toray 79.5 to 91 mmHg, Alteco 81 to 95.5 mmHg) and an improvement in gas exchange. A mortality benefit was observed in both patient groups compared to historical controls undergoing similar surgical procedures but did not achieve statistical significance due to the small sample size. In a prospective observational study of 40 patients undergoing orthotopic liver transplantation and multi-visceral transplantation, Hilmi and colleagues  examined endotoxin levels during the operative phase and for up to one month following transplantation. In transplant recipients mean pre-surgical EA values were significantly higher than controls (0.21 versus 0.5, P = 0.001) and further increased upon graft reperfusion in orthotopic liver transplants (P = 0.018). In liver transplant patients an EA ≥0.6 in the post-reperfusion phase was associated with a greater risk of significant post-reperfusion syndrome (P = 0.029). All liver transplant patients showed a significant increase in EA when rejection was present (seven episodes of rejection in five patients, P < 0.0001). In both organ transplant groups there was a significant positive correlation between mean intra-operative lactate levels and mean EA at each measurement point (r = 0.95, P = 0.047). In a number of patients, post-transplant endotoxin levels remained elevated for periods of up to 4 weeks and the authors speculated that this may have been due to continued liver dysfunction in the presence of porto-caval shunting since the Kupfer cells that line the sinusoids of the liver are known to play an active role in endotoxin clearance. In a separate study population composed of 19 pediatric living donor liver transplants, Sandana and colleagues  compared EA with the LAL assay by measuring peripheral and portal vein endotoxin levels pre-operatively. They found significantly increased endotoxin levels in the portal blood samples compared to peripheral blood (P < 0.05). This elevation in portal endotoxin activity was paralleled by increases in portal ammonia and beta-glucan levels. A similar increase was not observed using the LAL assay. The authors concluded that the EAA was superior to the LAL, even at low endotoxin levels and reflected hepatic clearance. Studies utilizing the EAA have confirmed the long-postulated link between the presence of systemic LPS and Gram-negative infection in hospitalized patients. In the MEDIC trial the EAA had a sensitivity of 85.3% for the detection of Gram-negative infection and a negative predictive value of 98.6% for the exclusion of Gram-negative infection and 94.8% for the exclusion of all infections. In this study endotoxemia was also observed in patients with Gram-positive and other infections as well as in patients with no culture-positive organisms. These observations suggest that LPS may translocate from the gut and that it may play a role in driving the inflammatory response in so-called 'sterile sepsis'. Other studies cited in this review, including those in pediatric patients undergoing surgical repair of congenital heart defects, cardiopulmonary bypass patients and patients with severe polytrauma, suggest that gut injury due to hypoperfusion may release LPS into the systemic circulation and that this toxin may play a synergistic role in the genesis of multi-organ failure. The presence of endotoxin at high levels (EA ≥0.6) was associated with an increased risk of developing severe sepsis (odds ratio 3.0, P < 0.001) and ICU mortality (P = 0.04, 10.9% versus 16.8%). Preliminary studies by Novelli and colleagues  combining the EAA and hemoperfusion devices to remove endotoxin in post-surgical patients suggest that the measurement of endotoxin in these patients as a selection criterion can potentially identify patients who may benefit from such intervention modalities. Initial studies by Cruz and colleagues  using endotoxin removal via hemofiltration devices have shown a hemodynamic and early mortality benefit. A rapid biomarker assay such as the EAA could prospectively identify patients for anti-endotoxin clinical trials by identifying a cohort of patients with high endotoxin levels, which are associated with adverse outcomes. Recently, the EUPHRATES trial (ClinicalTrials.gov identifier NCT01046669) has been initiated in North America combining EAA with an anti-endotoxin hemoperfusion therapy (Toramyxin column). EAA values ≥0.6 will be used as part of the entry criteria for patient inclusion in the clinical trial. Such trials combining measurement of endotoxin levels with specific anti-endotoxin therapies have the potential to establish a mechanistic link in humans between this bacterial toxin and mortality. The combination of a diagnostic to identify the injurious target molecule with a specific therapeutic agent is likely to increase the therapeutic 'signal to noise ratio' and select a responsive patient population similar to the approach used in pharmacogenomics. In the absence of a validated specific anti-endotoxin therapy the EAA is useful in ruling out Gram-negative infection in complicated ICU patients who present with the systemic inflammatory response and no clear cut focus of infection. The EAA may be useful in specific clinical scenarios encountered in the ICU when a clinical suspicion of infection is present without initial confirmatory microbiolgical evidence. This can be due to antibiotic suppression of bacterial growth or no detection of bacteremia due to a lack of organisms shed from an occult source of infection. We have used the assay to aid in the identification of occult undiagnosed foci of Gram-negative infection (that is, mediastinal abcess) and necrotic/ischemic bowel by measuring persistently high EA levels ≥0.6 over the course of 12 to 24 hours. The analytical attributes of the assay include a relative insensitivity to extrinsic LPS contamination, whole blood sample requirement (no need for centrifugation), rapid time to final result (approximately 30 minutes) with a relatively wide dynamic range (25 to 2,500 pg/ml WHO LPS) and a unit dose format that allows individual patient assays, obviating the need for sample batching. No peer reviewed or external funding was provided for preparation of this review article to any of the authors. Alex Romaschin is a co-inventor of the endotoxin activity assay and holds patents that have been licensed to Spectral Diagnostics, the company that manufactures and markets the EAA. Romaschin and Klein periodically act as paid consultants for Spectral Diagnostics. John Marshall has no competing interests.